Acceptance and commitment therapy (ACT) is an evidence-based therapy that has been successful in treating a variety of psychological issues, such anxiety, depression, substance abuse, trauma, eating disorders, and more. In contrast to other treatment options, ACT has proven extremely effective in helping clients who are “stuck” in unhealthy thought patterns by encouraging them align their values with their thoughts and actions. However, the ACT model is complex, and it’s not always easy to use. Traditionally, ACT is delivered with a focus around six core processes that are often referred to as the hexaflex: cognitive defusion, acceptance, contact with the present moment, observing the self, values, and committed action. Each of these core processes serves a specific function, but they are often made more complex than needed in both theory and in practice. So what if there was a way to simplify ACT in your sessions with clients? Edited by clinical psychologists and popular ACT workshop leaders Kevin L. Polk and Benjamin Schoendorff, The ACT Matrix fuses the six core principles of acceptance and commitment therapy (ACT) into a simplified, easy-to-apply approach that focuses on client actions and behavior as workable or unworkable, rather than good or bad. Most importantly, you’ll learn how this innovative approach can be used to deliver ACT more effectively in a variety of settings and contexts, even when clients are resistant or unmotivated to participate. 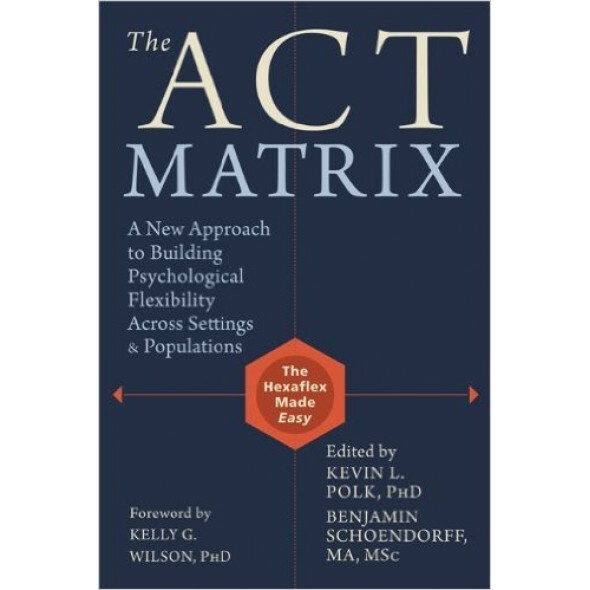 This is the first book to utilize the ACT Matrix model, and it is a must-read for any ACT practitioner looking to streamline his or her therapeutic approach.